Last week I was tagged in an old friend’s Facebook status. She was trying to make sense of GMOs and organic labels, aspiring to feed her family a higher quality diet, and looking for advice and input from various friends. And a nice little thread had broken out, with many people weighing in. They were talking about the merits of Trader Joe’s versus the Farmer’s Market, the many standards by which to “measure” food, and someone had linked to an old Food Babe article. Oh I have so many thoughts! Personally I love Trader Joe’s because it makes healthy (organic and minimally processed) food available to people at a *very* reasonable price. And for that I am forever grateful. Also, I eat a TON of beans and I love that their cans are BPA-free. Eating local is ideal but most people are not able to live the ideal, and I’m so glad that Trader Joe’s is there for them. As far as GMO and organic, anything that is certified organic is by default non-GMO, so that’s a good standard to aim for. IF it says organic, then it IS non-GMO. When you can’t get organic, it’s hard to know what’s GMO or not. Basically I assume that ALL corn and soy that is not organic, will be GMO. Those crops just are soooo widely GMO that it’s safe to assume all non-organic products will be GMO. Yuck. For me personally, I eat as locally, organically, and non-GMO as possible. And then I don’t sweat the rest. I believe that optimal health and wellness includes mental health (actually in my experience with clients, mental health/stress is probably the biggest factor in overall health), so for me, it’s very important not to get too focused on stressing out about every little thing I put in my mouth. And I realized, as I was writing this comment on my personal friend’s page, that I’ve written this, or something similar, dozens if not scores of times, all across the Internets. But never here, on my own blog, where I’m supposed to be writing about health and holistic wellness! So I wanted to go ahead and do that, I guess. I wanted to take a moment and share my thoughts on what I think it means to be optimally, holistically, healthy – and how that can best be achieved. I believe that the healthiest, highest quality food is fresh, local, whole, and organic. I believe that it is unrealistic to expect to eat the healthiest, highest quality food 100% of the time, and holistically healthy people are pretty much okay with that — because holistically healthy people have learned to chill the eff out around food. I believe that the mental anguish you feel over eating the cookie is infinitely more damaging to your physical health than the actual cookie itself. I believe in eating foods which make your body feel good, and avoiding foods which make it feel bad. Excessive cookies don’t make anyone feel good, but occasional cookies are delightful. If you can truly make choices based on the way that the food will make your body feel, then it’s hard to go wrong. But eating this way requires tuning in to your intuitive self, which takes practice. More importantly, it also requires NOT scrutinizing and over-analyzing every little burp, bump, hiccup, and bad day — because that sort of hyper-focus will only breed anxiety. There is a balance there, and that balance is the sweet spot. The sweet spot can only be found when you chill the eff out around food. This approach to eating, to health, to veganism, and to life — it means everything to me. So much so, that it truly influences every aspect and offshoot of the work I do here, in this space. –> It relates to raising vegan children, because raising a healthy child means raising a holistically healthy child, and that means not accidentally burdening your little ones with feelings of deprivation, “otherness”, or fear around food. 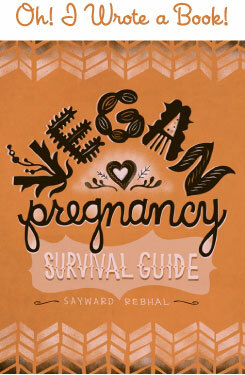 –> It relates to deciphering this ex-vegan thing, because over-restriction and eating out of balance are some of the primary reasons that people cite for abandoning their veganism in pursuit of a more stable mental or physical state. We see this trend consistently in our research. –> It relates to my Vegan Lifestyle Coaching, because food confusion and food anxiety is something I come across over and over (and over!) again with my clients. And in my experience, all the meal plans and recipes and tips and tricks would be meaningless, if I couldn’t help the person to really relax and find true pleasure in food and health again. –> And finally, it relates right here, to this blog. Because whether I’ve explicitly stated it or not, this perspective is everything I’m trying to promote in this space. To share the idea of balance and joy, which I find to be so sorely lacking in the overall “healthy living” online community. And also, that’s me! I drink lots and lots of green juice, and sometimes I drink gin. I eat a lot of salads, and I also eat store-bought vegan cheeses. Last night for dinner I ate these incredible all-raw tacos with walnut chorizo, and then I ate peanut butter pie with cookie crust for dessert (thank you dear friends for feeding me well). And this . . . is why I will probably never be big and famous in the “healthy living” world. Because really, people don’t want to hear, “balance“. People want a quick fix, or a straightforward equation. People respond to black and white. They want to hear, “this is always good, and that is always bad.” People respond to drawing lines. Because it’s easier to put things into discreet boxes, and it’s much more work to think in terms of nuance, and intuition, and relativism. But that, of course, is the very truth of it. Wellness is nuanced, and intuitive, and relative. Which . . . is not something you can sell. Oh well. And now, I’ve said it here. Now you have my thoughts on what it means to be holistically healthy, and why I believe that your physical health is so, so much more than simply the result of diet and exercise. I have to be honest, I’m really worried about hitting publish right now. I feel like this might be the most controversial thing I’ve ever written . . . Brilliant! Thank you for writing this post. The only thing that I’ve found that is confirmed bad about GMO produce in comparison to organics is that it has a lot higher risk of pesticide contamination (which is enough to convince me to eat as much organic produce as possible). The rest of the stuff is debatable. You’re great. For real. Keep it up. Yup, we did. Perfect example! I think this might be my favorite post you’ve written, and I been reading your blog since Waits was just a wee baby! The trap of “food and nutrition is EVERYTHING” is so hard to escape because guess what, for us control freaks, food is “easy” to control. Our stress level? Not so much. It took me years to figure out that my stress was the real issue…my nutrition was great (and I’m still working on the stress, to some extent). Thanks for this! Controversial or not, it needs to be said. That’s not actually true. The thing is that GM technology varies very widely. So yes some test cases may have higher pesticide residue. Others do not. Others in fact are designed to be resistant of pesticide exposure altogether. Where did you read about higher risk of pesticides? A link would be welcome. I’d like to share one but can’t front my phone so please look up the recent NPR article on the sweet potato – a food creates by GM technology many many years ago. Great post, love your honesty. I believe the Creator gave us the entire plethora of natural foods for our immense enjoyment and discovery. I am not a vegan but I really enjoy your recipes. I love green juice and I love my gin and tonics on occasion. So, so f-ing true! Really this is all of life. Humans are obsessed with categorizing and separating things as much as possible. I could go on for a long while about this, but I’ll save that for my blog. Life is a series of grays, and that includes food. This is such a great post! I have definitely been close to making myself crazy with trying to have the absolute perfect diet, but I agree that mental health is apart of whole health! Such a good post in this age of orthorexia. I know people who hardly ever eat anything because it’s all “wrong”, and it ends up being the opposite of healthy. Jem, I was just going to make these same points about GM foods. I find it so frustrating that people lump ALL GM food into the same “bad” category, which is the precise antithesis of this (well-written, except for that point) post. Some GM technology exists to make certain crops resistant to some pesticides, and those are the ones that give the rest a bad rap. However, there are SO MANY other types and reasons for developing GM technology, many of which alleviate hunger in developing worlds, target disease, seek to eliminate both pesticide use and food waste, etc. The reasons are so variable and many, if not most, are not harmful to the environment or to the consumers’ health. This, coupled with the general public’s lack of knowledge, is why I cannot support the labeling initiatives. FYI, I have a PhD in environmental biology and teach this topic at an environmental liberal arts college. If you want to read a great primer into the science of this subject I really recommend reading Tomorrow’s Table. WOWWW!!!!!!!!!! I am so happy you wrote this article!!!! So incredibly underrated, balance is. I totally believe balance in terms of mind, body and soul is so important, and its what missing in so many peoples lives who are struggling to be healthy. Everyone is so extreme, finding peace in punishing themselves into perfection and not feeling adequate when perfection isn’t met. I’ve had such trouble with this myself, and I found that being extreme also went hand-in-hand in hating myself. With balance comes self-love and acceptance, once I started to love myself and be kind and understanding, I was able to find balance and realize why I was choosing to be so extreme. Thank you for this amazing article! You are my FAVORITE vegan there is!! !